Friends , President Barcak Hussain Obama comes from US on the 3 day visit to India. During his visit Indian Prime Minister Sh. Narendra Modi and US President Barack Obama is going to discuss on the issue of Climate Changes, Defense Field and Economics. 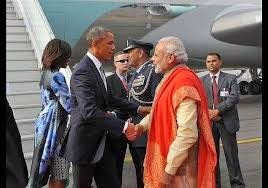 On 25 Jan 2015 President Barack Obama comes by his Personal Plane and Landed to Palam Airport Delhi .Where Modi was at the Airport to Welcome Obama. Greeting the American leader at the foot of the Air Force One Stairs wearing a gold Kurta. Obama and His wife Michelle Obama exited from the plane holding their hands and Shake Hands with Narendra Modi. Narendra Modi also Hugged Barack Obama and Patted him on the back. Obama has to meet with Modi and attend Dinner at Rashtrapati Bhawan. Obama has to visit to Rajgath to Tribute our Mahatma Ghandhi. Obama has to attend Joint Press Conference with Modi. Tomorrow he is attending the Republic day of India Pared as Chief Guest .